Ashalin Singh aces a plethora of characters in Salaam Stories. There are surprisingly few Muslims in South Africa. Only about 1.5% of the population according to past censuses. Surprising if you live in Cape Town, that is, where the number of Islamic adherents is closer to one in ten and the call to prayers sound across the City Bowl with sunset precision. Discovering your corner store closed at lunchtime on a Friday is also a common disappointment, especially if you’re in need of cigarettes, or milk. But because statistics don’t lie (which is different from them being manipulated), it is not so suprising that so few plays are written from a Muslim perspective. It is also unsurprising that Salaam Stories, which does, is set in Cape Town. The backstory to any Muslim viewpoint from Die Kaap is slavery, given that it was the Dutch and English slave trade that brought Muslim men and women from the East to this southwest corner of the continent. Further injustices were added layer by layer, decade by decade. In its amalgam of myth, anecdote, reminiscence, and skinner, Salaam Stories does not flinch from this past. It acknowledges it and places its shame where it belongs – on the heads of the perpetrators – and so moves without hindrance to the present. As a series of tales – a much shorter, Kaapse sort of Arabian Nights – Salaam Stories requires its single performer, who in this rendition is Ashalin Singh, to inhabit a number of characters. They range from the mal auntie whose job it was to wash dead bodies, to a dolled-up white drag queen, with a snoek vendor or so thrown in. Ashalin manages to encompass almost all of them within his features and accents. The invisible switch from narrator to Adderley Street tailor is flabbergasting. There are other equally sublime shifts. But as with so many actors, the child is not believable. Wide-eyed and fidgety, rushing words out in a nasal stream is not an emulation of an eight-year-old. Or a five-year-old. Not even a toddler. This is a bugbear, and an appeal to any actor who ever has to act the part of a child. Study them. Look closely, and for a long time. Find a niece or a nephew or a cousin and take notes. Failing that, hang around primary schools and risk being arrested. While we’re on bugbears, the other one is costume. This one is for the directors, which in this case was Niquita Hartley. Make sure they fit. Ashalin walks on in ivory trousers with overly-wide turnups to compensate for their length, and some weird sagginess around the crotch which we could never figure out the cause of due to the length of the shirt, which thankfully was a good fit. Altogether, looking downwards was a continual irritation and distraction. Hire a tailor. Get it right. It’s the seemingly small things that prevent us letting go into the current of the bigger story. We want to be assured we’re in the hands of professionals. The banishment of any such doubt is essential for theatre to become magic. But enough hitting these relatively young theatremakers with a pedant stick. The burial itself contained pathos, as did most of the scenes. And the stories, even if delivered in ill-fitting clothes, are important. Not least because the viewpoint from which they are told is not heard often enough. Certainly not to a secular outsider with a Christian upbringing. Which according to the stats is most of us South Africans (almost 80%). Seeing as we’ve wandered down the stats path, 80% is about what this rendition of Salaam Stories gets right, on all fronts: writing, acting, and directing. Which, despite its faults, makes it a play of distinction. 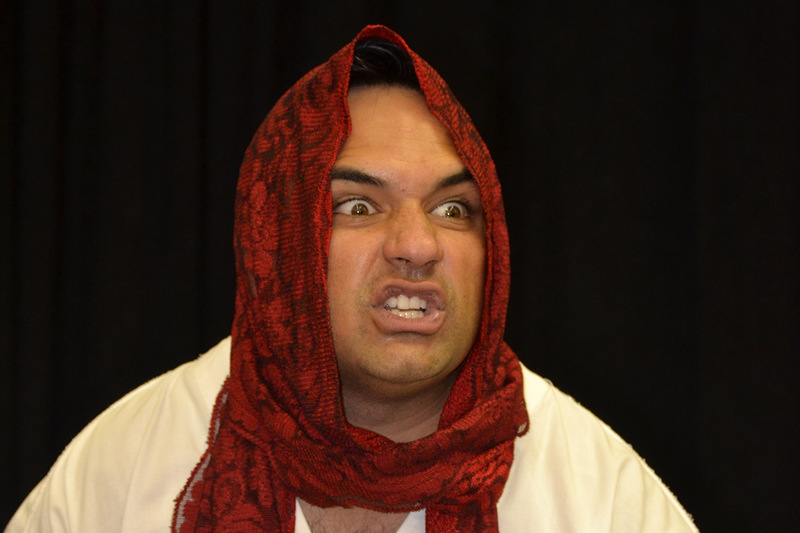 Salaam Stories is on at the Theatre Arts Admin Collective in Observatory until March 9. Book here.